Where are PBGG alumni now? If you’ve read my Bio, you know that I’m a Ph.D. student in the Plant Biology Graduate Group (PBGG) at UC Davis. We’re a pretty diverse group in terms of research interests. We have everything from computational biologists and biochemists to plant breeders and ecologists. This diversity got me and fellow PBGGer Mark Lemos wondering about what sort of careers alumni of our program were pursuing. To answer this question, we took to the internet to track down our alumni – primarily using LinkedIn, Pubmed, and Google. We were able to find 101/110 of Ph.D. alumni that had graduated during the previous 10 years. I presented our findings at the PBGG annual meeting in Spring 2013 and have decided to post them here for people who missed the meeting or want to revisit the data. 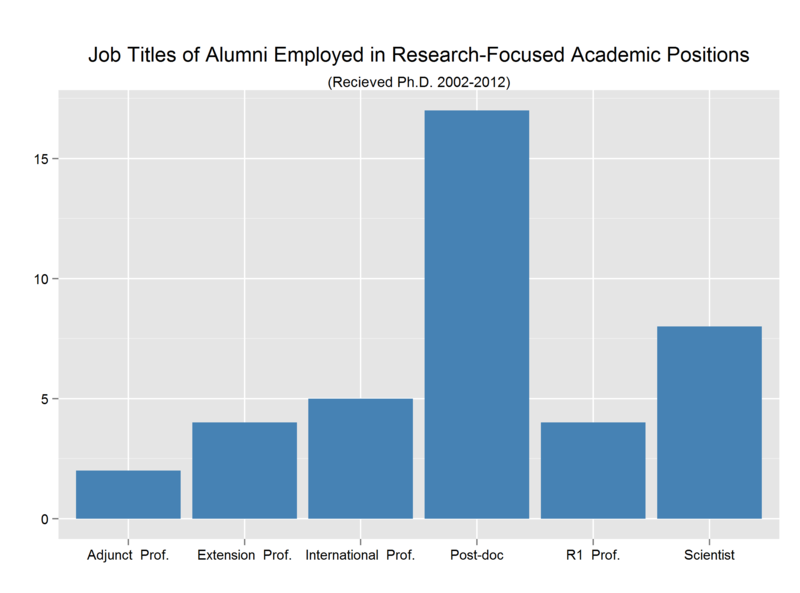 Given that the data includes many relatively recent graduates, the large number of post-docs is not surprising. It should also be noted that all but one of the “Extension Professors” listed above are at R1 institutions. I wanted to emphasize that extension positions are an option to consider for those looking for tenure-track research positions. Additionally, “International Professors” are primarily PBGG alumni that have taken positions in their home countries. The data show that 65% of our alumni that are in academia are employed in research-focused positions. The remaining 35% are employed in teaching-focused positions. 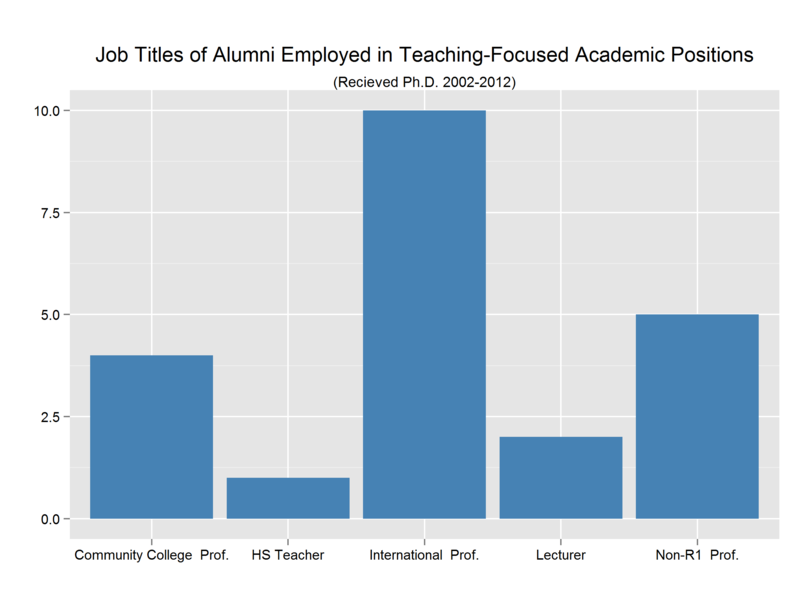 Overall, the data paint a pretty nice picture for alumni of the PBGG. The vast majority of our alumni have careers in science (though often not involving research) and the few that are unemployed are in that position by choice. You can visit the PBGG website to learn more about the program or contact me if you have questions about this survey.